This article is about the Mexican state. For the condiment, see Tabasco sauce. For other uses, see Tabasco (disambiguation). Tabasco (Spanish pronunciation: [taˈβasko] ( listen)), officially the Free and Sovereign State of Tabasco (Spanish: Estado Libre y Soberano de Tabasco), is one of the 32 Federal Entities of Mexico. 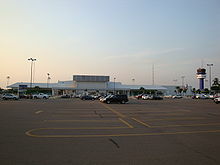 It is divided into 17 municipalities and its capital city is Villahermosa. It is located in the southeast of the country bordering the states of Campeche to the northeast, Veracruz to the west and Chiapas to the south, and the Petén department of Guatemala to the southeast. It has a coastline to the north with the Gulf of Mexico. Most of the state is covered in rainforest as, unlike most other areas of Mexico, it has plentiful rainfall year round. For this reason, it is also covered in small lakes, wetlands and rivers. The state is subject to major flooding events, with the last occurring in 2007, which affected eighty percent of the state. The state is also home to La Venta, the major site of the Olmec civilization, considered to be the origin of later Mesoamerican cultures. Even though it produces significant quantities of petroleum and natural gas, poverty is still a concern. ^ a. The state's GDP was $223,906,333,000 pesos in 2008, amount corresponding to $17,492,682,260 dollars, at a conversion rate of 1 dollar = 12.80 pesos (value of June 3, 2010). The Olmec civilization dominated much of what is now Tabasco 3,000 years ago, with its height around 800 BC. They were the oldest Mesoamerican culture which dominated areas in what are now the states of Mexico, Guerrero, Oaxaca, Veracruz and Tabasco as well as parts of Central America, and considered to be the founding culture for all of Mesoamerica. 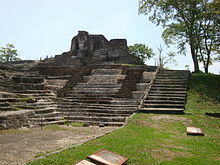 The main Olmec site in Tabasco is La Venta. The site covers an area of 5.3 square kilometres (2.0 sq mi) surrounded by swamps and marshes linked to the Tonalá River, 15 kilometres (9.3 mi) from the Gulf of Mexico. Around 300 AD, the Mayas began to dominate part of the state. 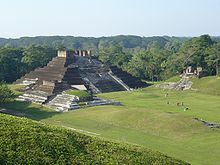 Mayan sites include Comalcalco, Pomoná, El Tortuguero and Jonuta (Prehispanic). The Mayans in Tabasco reached their peak between the 6th and 7th centuries. 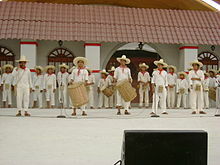 In the early 16th century, the main ethnicities of Tabasco were the Mayas-Chontals, the Zoques, and the Popolocas, living in small villages with the Mayan language dominating. The first contact with the Spanish came in 1518 when an expedition headed by Captain Juan de Grijalva disembarked at the mouth of the river that now bears his name. 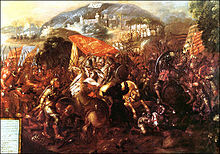 Hernán Cortés came the following year and fought the natives here at the Battle of Centla. As conqueror, Cortés received twenty female slaves, one of whom was La Malinche. The struggle between Liberals, who wanted a federal government, and Conservatives, who wanted a centralized government, played out in Tabasco with various skirmishes between Ruiz de la Peña leading the Liberals and Marcelino Margalli for the Conservatives. In 1829, the military in Campeche revolted against Mexico City and proclaimed its own government. Shortly after, Tabasco joined the movement and proclaimed a Conservative government. However, this government was shortlived. Political instability in the state and an outbreak of cholera forced Tabasco to rejoin the federation. In 1836, a group of Conservatives took control of the federal government, but Tabasco liberals decided to rebel against this government until they were defeated. During the Mexican–American War, troops under Matthew C. Perry arrived to Tabasco in 1846. Other ships arrived soon after and the troops took possession of the port of Frontera. On their first attempt to take Villahermosa upriver, they failed. The second attempt bombarded the city before successfully taking it. However, the Tabascans formed guerrilla groups and this along with the inhospitable climate forced the U.S. military to withdraw soon after. For the rest of the war, ships remained in the Frontera area to block commerce between Tabasco and central Mexico. After the Americans left, Tabasco governor Justo Santa Anna rebelled against Mexico City over the lack of support during the war. The Americans returned in 1847 to attack the capital. It was defended by local troops, but they did not have the necessary supplies. The Americans occupied the capital for another thirty-five days, causing great destruction. During the French Intervention in Mexico, the French took Villahermosa in 1862 installing a governor in 1862. Tabasco forces retreated into the mountains. Meanwhile, various Tabascans formed a newspaper called El Dissidente, which criticized the French-installed government. There were several insurrections against this government such as the one headed by Andrés Sánchez Magallanes in 1863. He raised a small army from various parts of the state and attacked the imperial army barracks in Comalcalco then moved onto Villahermosa in November 1863. Here they encountered imperialist troops at what is now called the Battle of Jahuactal, where the insurgents won, expelling the French from the state. The Porfirio Díaz period from the 1880s to 1910 was free from political violence and allowed the state to build infrastructure, but only slowly owing to its isolation. The capital, heavily damaged by decades of war, was reconstructed, with many old buildings torn down to make way for new ones. In 1879, the Instituto Juárez was inaugurated. In 1881, telegraph service connected Villahermosa with Mexico City. The capital received electricity in 1890, with the new state government palace opened in 1894 and the first bank in 1901. 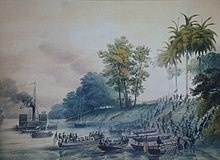 Tabasco experienced significant economic development during the Díaz period in the late 19th century, with cacao and other products shipped worldwide. However, this development led to widespread deforestation, which began in the latter decades of the 19th century with timber companies cutting large areas of rainforest. Anti-Díaz sentiment began in the decade of 1900 with efforts to keep Bandala from being re-elected. The first vocal opponent to the Díaz regime in Tabasco was local journalist Domingo Borrego. In Huimangullo, Chontalpa, the first "Club Anti reelection Melchor Ocampo" was formed to oppose the government but it was disbanded quickly. 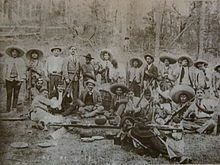 By 1909, there were a number of large protests in the state which led to the formation of the Gutierrista Party, headed by Ignacio Gutierrez Gomes along with two brothers. These and others in the state joined forces politically with Francisco I. Madero and a new Club Anti-reelecionista was formed in Huimanguillo. These efforts succeeded in defeating Bandala and replacing him with Policarpo Valenzuela, calming the situation in the state for a short while. After Madero was assassinated, the politics of the state fractured, with various factions vying for the governor's position leading to insurrection and frequent government changes who were allied with the various armies vying for power nationally. Another important episode in the history of the state was the governorship of Tomás Garrido Canabal after the end of the Revolution. He was elected in 1922, allied with Mexican presidents Obregón and later Calles. He implemented an ambitious socialist program, organizing unions and consolidating power though his Radical Socialist Party (Partido Socialista Radical). He reestablished the state's teachers’ college and established a system of rural schools. Livestock-raising increased and general economic levels rose. He prohibited the production and sale of alcoholic beverages in the state. An atheist, he persecuted the Catholic Church, destroying various churches including the Tabasco Cathedral. Events relating to this were portrayed in the novel The Power and the Glory by Graham Greene. He organized "cultural assemblies with the aim of persuading people away from religion, sometimes burning images of saints. He even forbade the use of crosses on graves and changed the names of towns and ranches to rid them of religious references. Unlike other parts of the country, there was little resistance against this repression of the church and the success of Garrido's dissuasion left a vacuum, which was later filled by missionaries from Protestant and Evangelical groups." His tenure as governor ended in 1935, when he was appointed the federal Secretary of Agriculture and he appointed Aureo L. Calles to take over. Opponents of Garrido declared this a violation of due process and held their own elections. Supporters of Garrido tried to stop the election, resulting in shooting and twelve dead. Oil and natural gas were discovered at this time and in 1974, the development of these resources began. The petroleum boom produced great wealth, but there have been disputes over the money earned from the facilities owned by PEMEX, the nation's oil company. The industry has put pressure on the state's infrastructure, housing and supplies of basic necessities. New roads, bridges and a modern airport have been constructed with oil money, along with a Centro de Investigaciones de la Cultura Olmeca y Maya, el Teatro del Estado, a planetarium and a convention center in the capital. The PEMEX facilities have caused environmental damage, and damage to local farmers’ crops. There have been issues related to the breaking of environmental laws, but corruption and the lack of legal jurisdiction outside of the federal government, which owns PEMEX, has hampered efforts to sue for enforcement. In 1996, hundreds of blockades of installations were carried out by locals with the active support of the Party of the Democratic Revolution (PRD). The most notable was the blocking of the bridge to the Sen oil field. It was broken up by police but the following month 30,000 marched on Villahermosa to protest. The friction between the populace and the government over oil and other issues led to some political restructuring in the state. This was accompanied with general dissatisfaction with the ruling party, the PRI, nationwide. Reforms to decentralize power away from Villahermosa were undertaken but in the 1990s, political instability remained with farmers, ranchers and others continuing to complain about how PEMEX was affecting their economic activities. Flooding has historically been an issue in the state, which has year-round heavy rainfall and various rivers flowing through it. 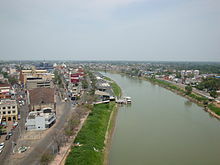 Villahermosa was founded on a hill between the Sierra and Grijalva Rivers. The growth of the city from the 1970s on has brought development down from the hill onto the floodplains. Recent major flooding includes events in 1975, 1990 and 1999. The last prompted the creation of the Programa Integral de Control de Inundaciones (Integral Program for Flood Control) to build dams, dikes and other flood control measures. These were in process of construction when the 2007 floods hit. From October 28 to 30, unusually heavy rainfall caused the Grijalva River to rise, overflowing the Peñitas Dam, as well as other area rivers. This eventually covered about eighty percent of the state's territory as deep as 4 meters (13 ft) in places, affecting over a million people. 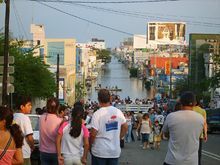 The flood damage was made worse by the presence of human settlements on flood plains and the lack of hydraulic infrastructure on the Sierra and Usumacinta rivers. There was also a lack of warning systems and evacuation plans for those downriver. The Wetlands Route emphasizes flora and fauna both on land and on the water. The main attraction is the Centla Biosphere Reserve. The reserve is home to a wide variety of wildlife species such as herons, storks, ibis, crocodiles, fresh water turtles, manatees and more. There is also over 500 species of plants with some of the most important concentration of aquatic plants in Mesoamerica. Other attractions include the Centla maritime port, the Museum of Navigation, the town of Frontera (where the Spanish founded the first European settlement on mainland America) and the Punta Manglar Ecotourism facility. Beaches in the area include Pico de Oro, Playa Azul, Miramar and El Bosque. ^ "Senadores por Tabasco LXI Legislatura". Senado de la Republica. Retrieved April 7, 2011. ^ "Listado de Diputados por Grupo Parlamentario del Estado de Tabasco". Camara de Diputados. Retrieved April 7, 2011. ^ "Resumen". Cuentame INEGI. Archived from the original on May 12, 2013. Retrieved February 12, 2013. ^ "Relieve". Simulador de Flujos de Agua de Cuencas Hidrográficas (INEGI). Retrieved November 11, 2011. ^ "Mexico en Cifras". INEGI. Archived from the original on April 20, 2011. Retrieved April 7, 2011. ^ a b c d e "Estado de Tabasco – Resumen" [State of Tabasco – Summary] (in Spanish). Mexico: INEGI. Retrieved December 31, 2011. ^ a b c d e "Estado de Tabasco – Territorio" [State of Tabasco – Territory] (in Spanish). Mexico: INEGI. Retrieved December 31, 2011. ^ a b c d e f Roldan, Nadia (November 10, 2008). "From MasExpos Magazine: Tabasco Itineraries". Meeting News. 32 (19): 34. ^ a b c Informe de las Inundaciones de 2007 en el Estado de Tabasco Diagnóstico Preliminar (PDF) (Report). Senate of Mexico Comisión de Asuntos Hidráulicos. March 5, 2008. Archived from the original (PDF) on May 15, 2013. Retrieved December 31, 2011. ^ a b c d e f g h "Lo mas antiguo de Mexico: Tabasco, tierra con historia" [The most ancient of Mexico:Tabasco, land with history]. Reforma (in Spanish). Mexico City. March 16, 2001. p. 3. ^ "Periódo Prehispánico" [Pre Hispanic period] (in Spanish). State of Tabasco. Archived from the original on October 6, 2010. Retrieved December 31, 2011. ^ a b c d e f "Etapa de la Conquista" [Conquest period] (in Spanish). State of Tabasco. Archived from the original on April 26, 2012. Retrieved December 31, 2011. ^ a b c "Epoca Colonial" [Colonial period] (in Spanish). State of Tabasco. Archived from the original on April 26, 2012. Retrieved December 31, 2011. ^ "1821 – Proclamación de Independencia" [1821 – Proclamation of Independence] (in Spanish). State of Tabasco. Archived from the original on April 26, 2012. Retrieved December 31, 2011. ^ "Epoca Independiente" [Independence period] (in Spanish). State of Tabasco. Archived from the original on April 26, 2012. Retrieved December 31, 2011. ^ "Iturbide y la República" [Iturbide and the Republic] (in Spanish). State of Tabasco. Archived from the original on April 26, 2012. Retrieved December 31, 2011. ^ "Centralistas y Federalistas" [Centralists and Federalitsts] (in Spanish). State of Tabasco. Archived from the original on April 26, 2012. Retrieved December 31, 2011. ^ a b "La Invasión Norteamericana" [The North American Invasion] (in Spanish). State of Tabasco. Archived from the original on April 26, 2012. Retrieved December 31, 2011. ^ "La Intervención en Tabasco" [The Intervention in Tabasco] (in Spanish). State of Tabasco. Archived from the original on April 26, 2012. Retrieved December 31, 2011. ^ "La Batalla de El Jahuactal" [The Battle of El Jahuactal] (in Spanish). State of Tabasco. Archived from the original on March 1, 2012. Retrieved December 31, 2011. ^ "Época Porfirista" [Porfirian Era] (in Spanish). State of Tabasco. Archived from the original on April 26, 2012. Retrieved December 31, 2011. ^ "Tabasco Revolucionario" [Revolucionary Tabasco] (in Spanish). State of Tabasco. Archived from the original on April 26, 2012. Retrieved December 31, 2011. ^ Barbara A. Tenenbaum and Georgette M. Dorn (eds. 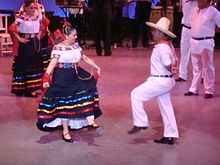 ), Encyclopedia of Latin American History and Culture (New York: Scribner's, 1996). ^ Stan Ridgeway, "Monoculture, Monopoly, and the Mexican Revolution" Mexican Studies / Estudios Mexicanos 17.1 (Winter, 2001): 143. ^ a b "El Garridismo, Esplendor y Fin" [Garridismo – Splendor and End] (in Spanish). State of Tabasco. Archived from the original on October 12, 2010. Retrieved December 31, 2011. ^ "La Revolución Mexicana en Tabasco" [The Mexican Revolution in Tabasco] (in Spanish). State of Tabasco. Archived from the original on April 26, 2012. Retrieved December 31, 2011. ^ Town, Sara (Jan–Feb 2001). "Oil at the grassroots: Report from Tabasco". NACLA Report on the Americas. 34 (4): 34–35. ^ "Introducing Tabasco". Oakland, CA: Lonely Planet Travel Guides. ^ a b "Pobreza extrema agobia a 150 mil familias" [Extreme poverty weighs down 150,000 families] (in Spanish). Villahermosa: Tabasco Hoy. May 18, 2007. ^ a b c d e f g h "Infraestructura Social y de Comunicaciones" [Social Infrastructure and Communications]. Enciclopedia de los Municipios de México Tabasco (in Spanish). Mexico: INAFED Gobierno del Estado de Tabasco. 2010. Retrieved December 31, 2011. ^ a b c d e "Estado de Tabasco – Economía" [State of Tabasco – Economy] (in Spanish). Mexico: INEGI. Retrieved December 31, 2011. ^ "Ruta Villahermosa" [Villahermosa Route] (in Spanish). State of Tabasco. Archived from the original on February 25, 2012. Retrieved December 31, 2011. ^ "Ruta del Cacao" [Cacao Route] (in Spanish). State of Tabasco. Archived from the original on December 27, 2011. Retrieved December 31, 2011. ^ "Ruta del Cacao Jalpa de Méndez" [Cacao Route Jalpa de Méndez] (in Spanish). Mexico: State of Tabasco. Archived from the original on April 26, 2012. Retrieved December 31, 2011. ^ "Ruta del Cacao Comalcalco" [Cacao Route Comalcalco] (in Spanish). Mexico: State of Tabasco. Archived from the original on February 13, 2012. Retrieved December 31, 2011. ^ a b "Comalcalco" [Comalcalco] (in Spanish). State of Tabasco. Archived from the original on April 26, 2012. Retrieved December 31, 2011. ^ "Ruta del Cacao Paraíso" [Cacao Route Paraíso] (in Spanish). Mexico: State of Tabasco. Archived from the original on January 13, 2012. Retrieved December 31, 2011. ^ "Ruta Ríos" [River Route] (in Spanish). State of Tabasco. Archived from the original on April 1, 2012. Retrieved December 31, 2011. ^ "Ruta Pantanos" [Wetlands Route] (in Spanish). State of Tabasco. Archived from the original on April 1, 2012. Retrieved December 31, 2011. ^ "Ruta Aventura en la Sierra" [Mountain Adventure Route] (in Spanish). State of Tabasco. Archived from the original on February 12, 2012. Retrieved December 31, 2011. ^ "Ruta Olmeca-Zoque" [Olmec Zoque Route] (in Spanish). State of Tabasco. Archived from the original on February 12, 2012. Retrieved December 31, 2011. ^ "Ruta Biji Yokot'an" [Biji Yokot’an Route] (in Spanish). State of Tabasco. Archived from the original on April 1, 2012. Retrieved December 31, 2011. ^ a b "Estado de Tabasco – Población" [State of Tabasco – Population] (in Spanish). Mexico: INEGI. Retrieved December 31, 2011. ^ "Trajes Regionales" [Regional Garb] (in Spanish). State of Tabasco. Archived from the original on January 5, 2012. Retrieved December 31, 2011. ^ a b c d e "Gastronomía Tabasqueña" [Tabasco Gastronomy] (in Spanish). State of Tabasco. Archived from the original on September 6, 2011. Retrieved December 31, 2011. ^ "La Venta" [La Venta] (in Spanish). State of Tabasco. Archived from the original on February 4, 2012. Retrieved December 31, 2011. ^ "Tabasco: Ofrece accion y arqueologia" [Tabasco: Offering action and archeology]. El Norte (in Spanish). Monterrey, Mexico. September 9, 2001. p. 6. ^ "Malpasito" [Malpasito] (in Spanish). State of Tabasco. Archived from the original on December 13, 2011. Retrieved December 31, 2011. ^ "Pomoná" [Pomoná] (in Spanish). State of Tabasco. Archived from the original on December 29, 2011. Retrieved December 31, 2011. ^ "Reforma" [Reforma] (in Spanish). State of Tabasco. Archived from the original on December 5, 2011. Retrieved December 31, 2011. ^ "Antecedentes" [Antecedents] (in Spanish). Universidad Intercultural del Estado de Tabasco. Retrieved December 31, 2011. Wikimedia Commons has media related to Tabasco.